Cal here, and welcome to Tuesday Stretch. Recently Phil Waln shared photos of an unusual Northwood comport in Topaz stretch glass. I thought I would share a photo of another unusual Northwood comport which has been known for some time. I do not believe there are any other examples known in this color and iridized treatment. The comport to which I refer has a tree bark base; the base glass is custard and it is iridized with what appears to be a marigold spray. It is very attractive and always gets a round of “ohs and ahs” when it is on display. The photo in which is it included also shows two other unusual stretch glass items. The vase you will likely recognize as an Imperial Jewels shape and indeed it is from the Imperial Jewels line. The cuttings on the vase make it a one-of-a-kind. The third item in the photo is a Diamond cobalt blue car vase. Car vases in stretch glass are tough to find (tougher to find in pairs, as they were originally sold) and this one is particularly difficult to obtain. 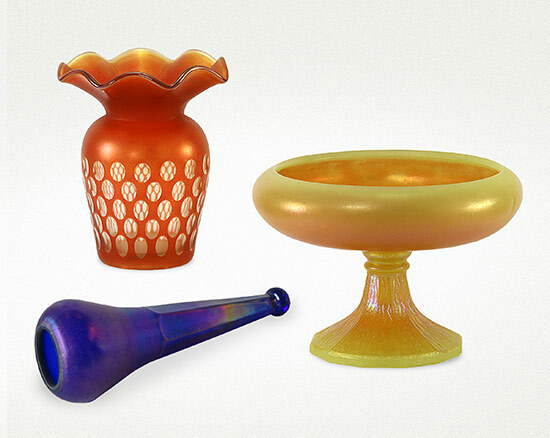 There you have it, three very unusual examples of stretch glass which I am willing to bet would find a welcome home in most carnival glass collections. I’m keeping it short tonight as Jeff and I are headed out to celebrate our 5th anniversary. It doesn’t seem possible that we have been together 5 years, but the calendar confirms that to be the case. I hope you all have (or had, depending on when Brian puts this out) a nice evening and we will be back with another Tuesday Stretch on the first Tuesday in September.